Today we are showcasing the new Mama Elephant stamp set called "Rustic Spring". This is a tag building set, but as you will see...doesn't have to be used that way. I paired it with the Crate Paper "Fourteen" collection, for what I think makes a super sweet home card! Here is what I made! 3. Cut a banner edge to map paper, then adhere to the bottom of the heart paper. 4. Zigzag stitch along the top of the banner, then adhere the entire paper block to the card front. 5. Stamp the sentiment directly above the stitching. 6. Stamp the house to the banner, then stamp it to woodgrain paper, & pink chevron paper. 7. Cut out the corresponding layers, glitter the top, and layer to the banner. 8. Diecut a teeny heart from felt, and adhere to the middle of the house. 9. Add a little doily strip & a fussy cut heart to the upper right corner. 10. Accent with a felt star, jewels & pearls as shown to finish. I know the other Mama Elephant designers have some amazing cards to share with you using the Rustic Spring set as well, so be sure to check them out! I hope you've enjoyed my sweet little home card today!! Have a wonderful rest of your Tuesday!! So cute - I love the sparkle and the mixture of embellishments! Thanks so much for playing along with this week's CAS(E) This Sketch! So sweet Lea! Love those subtle layers under the birdhouse and the soft colors:). Have a great day!! that little birdhouse is adorable! Love the glitter and pink thread. :) Thanks for playing along with CAS(E) This Sketch this week! 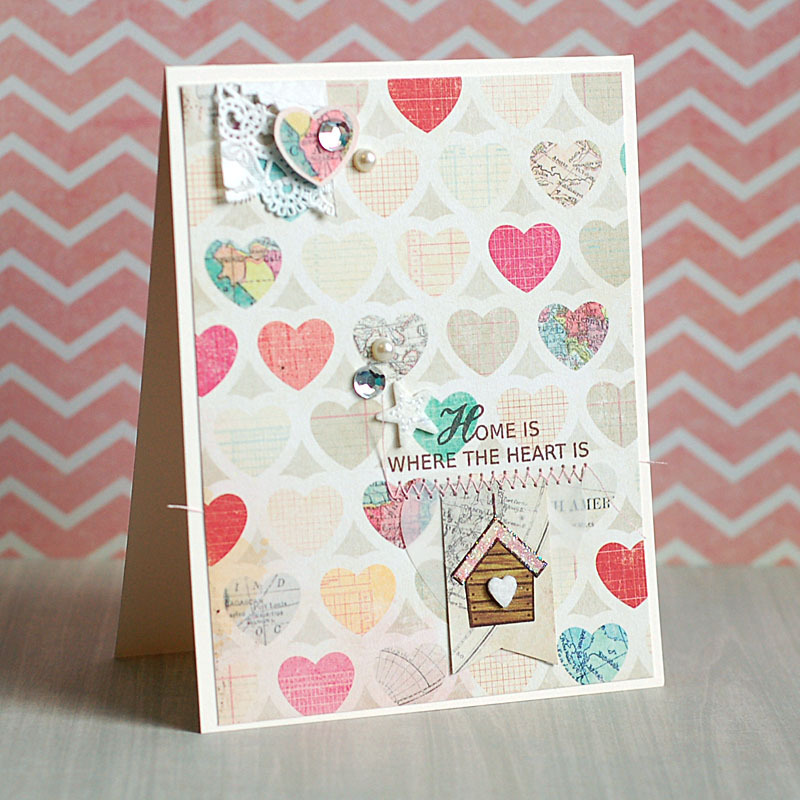 Lovely card- I live the heart background paper and that cute birdhouse. Thanks for playing along with us at CAS(E) this Sketch! So pretty, Lea! Love the papers and the way you layered all the embellishments, stamps and stitching! Super cute card, Lea! Fun new stamps and I love your artsy design. The little house is adorable, and I love the scattered sequins and pearls. Mixed with that cute paper, this has a fun collage feel to it! So pretty! Love the colors and the sparkly roof! you have such feminine touch with your work, Lea! love love this!